In a food processor, combine the chickpeas with the liquid, garlic, lemon juice and tahini and puree to a chunky paste. Scrape down the side of the bowl. Add 2 tablespoons of olive oil and the paprika and puree until smooth. 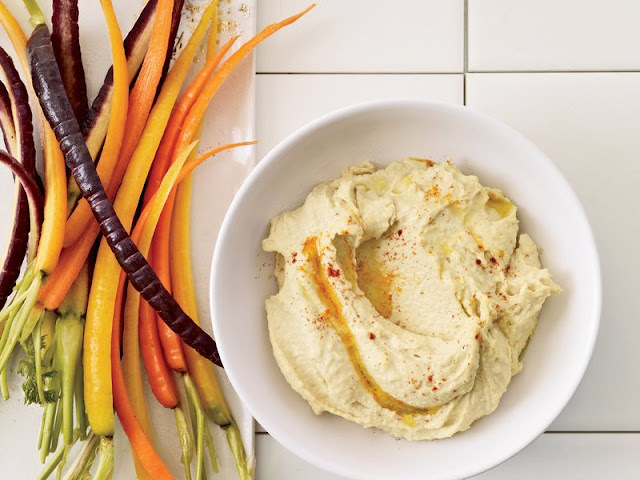 Season the hummus with salt, drizzle with olive oil and serve with pita chips or crudités. The hummus can be refrigerated for up to 5 days. One serving 119 cal, 19 gm carb, 6 gm fat, 0.7 gm sat fat, 5 gm protein, 5 gm fiber.